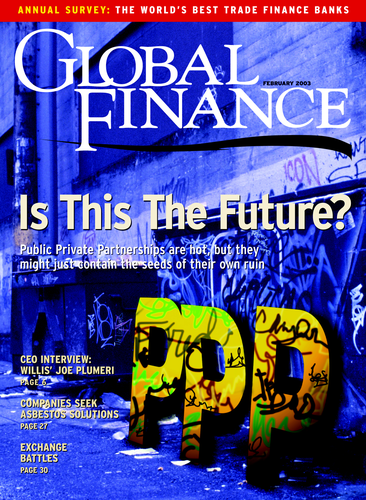 US corporate bond issuance in 2002 fell 28% to $465 billion, according to analysts at Dealogic in New York. The largest investmentgrade issue was General Electric Capital’s $6.9 billion, two-part offering on March 13 2002, which comprised $2 billion of five-year notes and $4.9 billion of 30-year bonds. 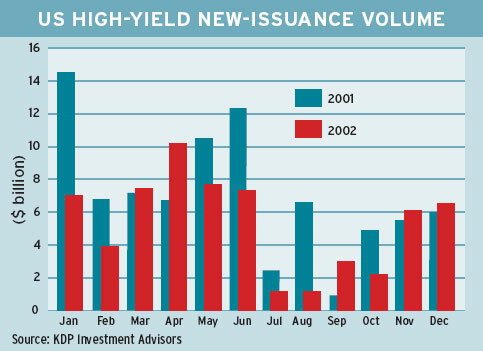 High-yield volume in 2002 totaled $61.9 billion via 245 deals, a 21% decrease from $78.2 billion through 261 deals in 2001, according to Dealogic. The largest high-yield deal was Owens-Brockway Glass Container’s $1 billion of seven-year senior secured notes.The issue was sold at 425 basis points over treasury securities via Goldman Sachs and Banc of America. Credit Suisse First Boston remained the top bookrunner for US highyield corporate issuance in 2002, with a 16% market share. Deutsche Bank was second, with 13% of the market. Absolute returns in the US bond markets are unlikely to challenge the strong showing of last year, when treasury yields declined between 50 basis points and 125 basis points, depending on maturity, says Kenneth Hackel, chief US fixedincome strategist at Merrill Lynch in New York. 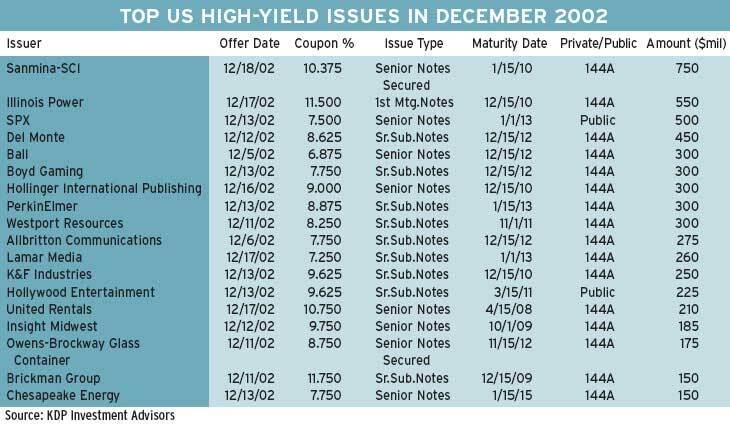 “While the economy remains choppy, the labor market weak and future Federal Reserve activity uncertain, the current low level of yields limits the upside potential of treasury securities on an absolute basis,” Hackel says. In addition, a growing budget deficit should raise expectations for significantly greater issuance in the years ahead, he says. Robert DiClemente, US chief economist at Citigroup’s Salomon Smith Barney in New York, says the Fed is likely to remain very patient and is not inclined to stir expectations of higher rates prematurely. Chances are the ultimate break will be toward higher rates, but a tradingrange environment will linger into the spring, DiClemente says. Both commercial paper issuance and business loans increased late last year, suggesting that capital investment may be starting to recover, he adds. California-based Sanmina- SCI, a contract manufacturer of electronic components, closed a $1.025 billion financing, comprising $750 million of senior secured notes in a private placement and a $275 million senior secured credit facility.The issue of notes was the largest high-yield offering in December 2002. Sanmina-SCI signed a three-year supply agreement in January 2003 to provide IBM with additional manufacturing services in North America and Europe. Sanmina-SCI says its revenues over the threeyear term of the agreement are expected to be in excess of $3.6 billion. The California company will acquire certain IBM manufacturing operations in Scotland and Mexico as part of the outsourcing agreement.